I have some advice for French bosses in charge of a disintegrating company - take a cool box of sarnies to work because the chances are you'll get taken hostage by angry marauding employees. It seems quite incredible to imagine that anyone would think this could have a positive outcome. Flouting the law, you would think, would result in a call to the cops to deal with this public disorder, but we are in France, and if you remember, the cops rarely intervene in shows of union unrest. Think about all those petrol refineries that are blocked when lorry drivers go on strike, thus crippling the country. They should send the cops in to unblock the roads, but we are left to sit at home or cycle, and starve, because no one wants to call in the heavy mob to remove a bunch of lawbreakers. There have been at least 3 cases of trapped bosses recently. Companies which fold have to set up a 'plan social' which aims to help those lose their jobs get the best financial compensation possible, and help with finding another job. Sometimes they don't go far enough, and that's when employees get so angry that talks break down and they lock the bosses in their offices. Ségolène Royal, France's current chief agente provocateur finds this all simply splendid and is encouraging workers to take the law into their own hands like mad, while reminding them that this is actually illegal. What would we do without her rallying of the troops? The PS boss, Mme Aubry actually backed her up! Well, France is a Communist country, so I suppose it's to be expected. 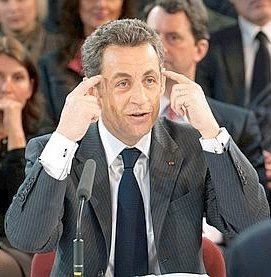 Sarko has finally decided that enough is enough, however, and that this state of affairs cannot continue. I'm not sure what he's going to do about it though. He says, rightly, that taking a boss, even a bad boss, hostage, is unacceptable and unlawful and just aggravates an already dire situation. So, will he send in the gendarmes? And will he take action the next time lorry drivers block the petrol refineries?